Vintage 1960's Bossons Chalkware Wall Plaque "Pony Girl" RARE. A vintage 1960's Chalkware Wall Plaque by Bossons. 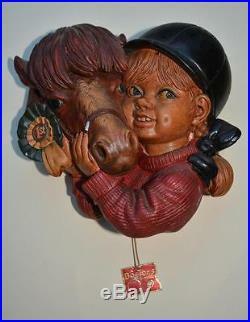 This is "Pony Girl" It is very rare and difficult to find Bosson's wall plaques in perfect condition. As with many of these the paint tends to flake. This plaque has paint flakes as per the image. THERE IS ALSO A SMALL CHIP TO THE RIDING HAT AND TO THE NOSE-BAND. Show off your items with Auctiva's Listing Templates. The item "Vintage 1960's Bossons Chalkware Wall Plaque Pony Girl RARE" is in sale since Sunday, September 18, 2016. This item is in the category "Collectables\Decorative Ornaments & Plates\Bossons". The seller is "just4flo" and is located in Dartmouth. This item can be shipped to United Kingdom, Antigua and barbuda, Austria, Belgium, Bulgaria, Croatia, Cyprus, Czech republic, Denmark, Estonia, Finland, France, Germany, Greece, Hungary, Ireland, Italy, Latvia, Lithuania, Luxembourg, Malta, Netherlands, Poland, Portugal, Romania, Slovakia, Slovenia, Spain, Sweden, Australia, United States, Russian federation, Canada, Brazil, Japan, New Zealand, China, Israel, Hong Kong, Norway, Indonesia, Malaysia, Mexico, Singapore, South Korea, Switzerland, Taiwan, Thailand, Bangladesh, Belize, Bermuda, Bolivia, Barbados, Brunei darussalam, Cayman islands, Dominica, Ecuador, Egypt, Guernsey, Gibraltar, Guadeloupe, Grenada, French guiana, Iceland, Jersey, Jordan, Cambodia, Saint kitts and nevis, Saint lucia, Liechtenstein, Sri lanka, Macao, Monaco, Maldives, Montserrat, Martinique, Nicaragua, Oman, Pakistan, Paraguay, Reunion, Turks and caicos islands, Aruba, Saudi arabia, South africa, United arab emirates, Ukraine, Chile.